Established by the regulation C/REG.23/11/08 at the 61st Session of ECOWAS Council of Ministers in 2008, ECREEE is a specialized agency of ECOWAS, and acts as an independent body but operates within the legal, administrative and financial framework of ECOWAS rules and regulations. ECREEE has as its mandate to contribute to the sustainable economic, social and environmental development of West Africa by improving access to modern, reliable and affordable energy services, energy security and reduction of energy related GHG emissions and climate change impacts on the energy system. This the Centre does through strategic programmes as the ECOW-GEN. 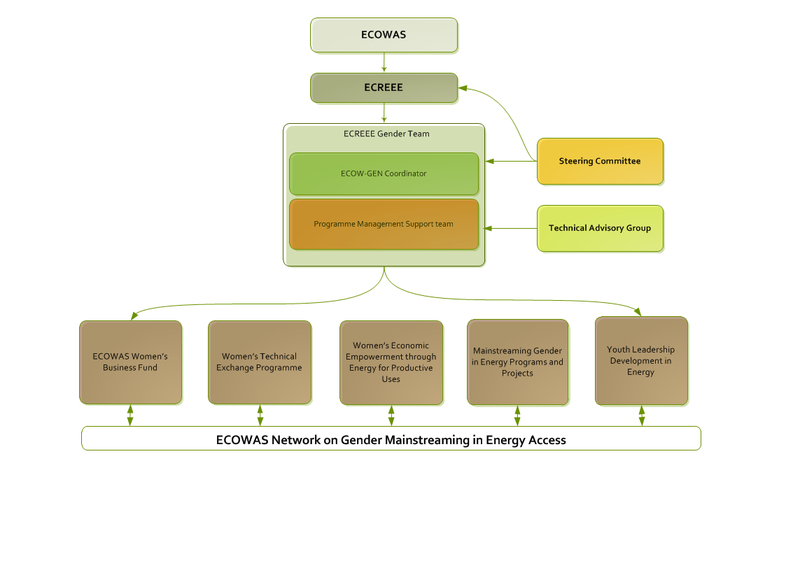 Thus, under the authority of ECOWAS, ECOW-GEN would be implemented by ECREEE through the ECREEE Gender Programme Management Team, and with the support of a Steering Committee and a Technical Advisory Group. The main functions of these external groups (the Steering Committee and Technical Advisory Group) will be to provide strategic guidance for the development and implementation of activities in line with the goals and objectives of the programme. The ECREEE Gender Programme Management Team, comprised of the Programme Coordinator and a Programme Management Support team, will be responsible for implementing the activities recommended and endorsed by the Steering Committee and Technical Advisory Group.